Clinking beer glasses, good conversation, and stellar pub grub is how it is at Pappy McGregor’s. But it’s not just about the all-American burger, lobster mac and cheese, or signature garlic fries. It’s about the specialty drinks, too. Owner Donovan Schmit said the pub is always refining its cocktail program whether it’s craft or local. “We’re always trying to keep it fresh and new,” he said. Schmit’s current favorite is the Birds and Bees—vodka, St. Germain, honey syrup, and fresh lemon. “We make ice cubes with baby’s breath. It’s really refreshing and something you don’t see around here,” he said. Butting right up to the Pacific Ocean is the Old Cayucos Tavern and Cardroom’s old timey establishment, where you can grab a pint and sway to the sounds of rock ’n’ roll. Built in 1906, the tavern originated as an old cowboy bar, and it’s still put together with wooden walls and dollar bills hanging from the ceiling. The Tavern’s the best place for live music and a great time. It even has its original poker room where you can try your luck. There’s not wrong way to live it up at the Tavern. 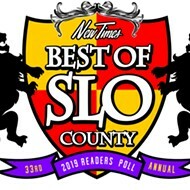 Always winning the hearts of our locals, Black Sheep wins Best San Luis Obispo Bar yet again! If consistency is key, then Black Sheep sure has got it down. They’ve got the food down. (If you haven’t tried their buffalo mac and cheese, do it now. No seriously, right now.) And their awesome bar staff has definitely got the drinks down. 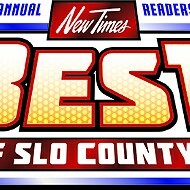 One of their own, Nicole, also won Best Beverage Slinger in SLO County, again. I know what you’re thinking, this must be “the spot.” Well, you’re right. It really is. You might have heard of Mason Bar after it made its debut in the Village of Arroyo Grande last year. But more recently, it’s grown into so much more than just a bar. 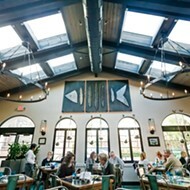 Now the Mason Bar and Kitchen, it expanded, adding a beautiful fire-lit dining room, expanding a delicious locally sourced menu, and continuing the popularity of their unique barrel aging program. General Manager Daniel Perez couldn’t be more proud of how far they have come. “We truly appreciate all the support and recognition from the readers, voters, and the ever-expanding pool of locals that have continued to support us from the start,” Perez said. Sitting right on the pier with the ocean in full view is Mr. Rick’s. Equipped with a large front patio, beach-goers can grab a cool drink on a hot summer’s day. The bar also has great pub eats to go along with that thirst-quenching adult beverage, everything from tacos to nachos. As the sun goes down, the music scene comes alive, and DJs and bands play into those warm (or foggy) summer nights to keep the dance floor moving and the drinks flowing. While craft spirits are the latest alcoholic darling to spring up in Paso Robles, which now boasts a whole distillery trail, Re:Find Distillery was one of the region’s hard-alcohol trailblazers. “We put a lot of energy into educating consumers about craft spirits,” owner Monica Villicana said. The distillery creates gin, vodka, seasonal sips like limoncello, and even a rye whiskey. Re:Find is also bringing the good stuff to downtown Paso Robles by turning the old Fox Theatre into a tasting room and distillery while keeping that iconic movie house look. After closing its doors in 2015 to make the jump from Garden Street to Higuera, SLO Brew revamped its music vibe. Manager Johnny Kenny said the new location has better sound and lighting for each weekly performance. “We know how much it means to the SLO music scene to ‘get it right,’” Kenny said. While many will miss the memories made at the old venue, he said the concert experience remains the bar’s top priority. “SLO Brew offers an intimate concert experience where you can see some of the biggest names in music in a small venue where you’ll get up close and personal with your favorite artists,” he said. Come Thursday evenings in the summertime, one can almost smell love—and, of course, tri-tip—wafting through the air in downtown SLO. It turns out that SLO Farmers’ Market is for more than just barbecue. It’s for burgeoning love. There’s a lot to do, and it’s casual enough to make for an unintimidating first date. “It’s fun,” said Ariana Burton, market manager. “It’s entertaining. You can listen to music and get dinner all in one place.” Plus you can stock up on local produce (and, ahem, that sweet smelling bouquet of fresh-cut flowers). Double (maybe even triple) score. Going solo and belting out the lyrics to Brittany Spears’ “You Drive Me Crazy” or singing along with a group of friends to Whitney Houston’s “I Wanna Dance With Somebody” is the perfect way to spend a Friday night. In downtown Arroyo Grande’s favorite bar, you can do that on more than just Friday night. Singers young and old take a swing at the mic, and even if you’re no Mariah Carey, the crowd is very supportive and forgiving. Only two bearded men can make that riotous sound. Kirk Nordby and Nick Motil made solo music until they came together in 2014 at a songwriter showcase. “Our ability to harmonize our voices was one of the first indications that we should pursue a project together,” Nordby said. The duo blends the sounds of folk and R&B, with the likes of guitars, a harmonica, and feet. “Nick fashioned a suitcase kick drum out of an old leather hat box to drive the beat with acoustic guitars,” Nordby said. The two are currently working on their sophomore album, and they’ll be performing this summer at Concerts in the Plaza on July 17. Every sip is a treat when you have a handcrafted, super fancy Sidecar cocktail in hand. “We’ve curated a staff of people who have bought in to our passion,” said Josh Christensen, owner. Sidecar recently redid its cocktail menu, and one of the standouts is Midnight in the Garden of Evil, a tequila beverage that features poblano chili liquor and pink guava, topped off with a bruleed lime wheel. Enjoy one quick, as Sidecar is looking to relocate to Marsh Street, where it will be reborn as the Killjoy Social Club. Whether it’s blended or on the rocks, nothing beats a well-made margarita. It’s the perfect drink to celebrate a special occasion, or to sip on at the end of a long day. Why not grab one (heck, make it two) of these delightful concoctions from Old Juan’s Cantina in Oceano. Located just minutes from the beach, Old Juan’s is a family Mexican restaurant with a well-stocked bar and seriously tasty margaritas. While the strawberry margarita packs a fruity-tasting punch, people serious about upping their “rita” game should go for Old Juan’s Classic Cadillac. A quick glance on Yelp is all you need to see that weekends at Sidecar Cocktail Co. is the place to be for a topnotch Bloody Mary. Select from a whole menu of the boozy brunch drink (garnished with celery, Spanish olives, and a pickled Brussels sprout, yum!). “People have come to expect that we have unique things behind the bar,” owner Josh Christensen said. Keeping up with different sport games and sports-watching grub is a no-brainer for Buffalo Wild Wings. With tons of TVs to keep an eye on, it’s the place to be to enjoy good eats and talk about the latest NBA player or NFL touchdown, according to General Manager Nick Zachary. “It’s all about the social experience; it’s what we preach,” he said. “We make sure all the games are on, the food is hot, and the beers are cold.” Zachary is a traditional guy so when it comes to choosing wings he goes for the Buffalo, New York-style covered in honey barbecue sauce. With grapes planted in the early days of California missions, the grapes in the Edna Valley are of the highest quality. The rich soil and coastal breezes make for almost perfect weather to nurture and grow countless rows of grapevines to bring bottles to tables locally and throughout the state. The Edna Valley Vineyard follows in owner Jack Niven’s footsteps to craft the delights of smooth chardonnay. If there’s one thing we know about SLO County, it’s that our local residents sure do love wine. And our wine-lovin’ readers seem to really love Laetitia’s bubbly. Are we even surprised that Laetitia won this category again? Neither is Laetitia’s sparkling wine maker Dave Hickey. “Our vineyard property was specifically selected for growing sparkling wine grapes,” Hickey said. “The methods used to make the wines are based on the oldest traditions of Champagne—add that to the Coquard Champagne presses, and there you have the perfect recipe to make people smile.” Bubbles make me smile, too. Tucked between the green hills south of San Luis Obispo is the Edna Valley Vineyard covered in its endless rows of grapevines. The views make for a lovely weekend getaway of sipping wine and leaving the cares of the city behind. Equipped with knowledge of staff onsite, each sip brings you closer to the taste of local fields. The tasting room recently reopened with a remodeled outdoor patio—just in time for summer sipping. Every SLOcal appreciates what Luis Wine Bar brings to the often-hectic downtown scene: “It provides a little bit of a different atmosphere than other places,” owner Vanessa North said. “It’s a little lounge-ier, a little different ambience.” Kick back in a classy, cozy booth with a glass of wine from Portugal or Paso Robles—take your pick—or enjoy some fresh air out on the patio overlooking the San Luis Creek. Either way, you’re in for a good time and even better drinks. Ask for a flight of their international region of the month, which comes with a glass of local wine made from similar grape varieties for comparison. Katie Hayward is in the business of taking people into the Paso Robles wine country. Born and raised on the Central Coast, Hayward said she’s really passionate about the area and what it has to offer her customers. “Our tours are very customized; we’re not cookie-cutter,” she said. “If we have guests that like white wines, I’ll find them the best wineries, or if they want a tour where they can talk with the vintner, we do that, too.” Not only are the tours personalized, the bus drivers add their own flair and knowledge to each trip. Bartender and server Nicole has been mixing up drinks at Black Sheep Bar & Grill in downtown SLO for the past 11 years. Her regulars range in age from 3 to 84. “It’s so relationship based. You look forward to seeing the same people on those same days of the week. I think people come back because they like the way you make them feel.” Stop on by for a Bloody Mary, one of Nicole’s favorite drinks to make. Those in search of a caffeinated pick-me-up in a cozy, cheerful setting need look no further than Scout Coffee, now with two locations: on Garden Street in downtown SLO and a newer spot off of Foothill Boulevard. Owner Sara Peterson attributes Scout’s success to good vibes. “We really strive for a great product, great service, and great atmosphere,” Peterson said. Seasonal goodies on offer right now include a strawberry buttermilk shake, honey lavender tea bowl, hibiscus sparkling tea, and strawberry pistachio scones. SLO Roasted Coffee - Central Coast Coffee Roasting Co.
Co-owners and siblings Julie and Chris Galloway have been roasting coffee beans for three decades! “Our father, Norman, started the business 33 years ago,” said Ms. Galloway. “He named our popular Darned Good Coffee. We have been running it since 2000, when he retired, along with husband and nephew so we are truly a family-operated business.” They use a European-style roasting technique, and Roastmaster Adam Boyd roasts the beans to perfection. Their retail shop has everything java aficionados need for that perfect cup o’ Joe and gives free coffee tours on roasting days, by appointment. Galloway’s favorite brew is Morning Fog Lifter. Mine is Cinnamon Gingerbread! Aaaahhh!